A memorial service for Walter J. Harrelson will be held at 3 p.m. on Sunday, Sept. 23, in Wait Chapel. 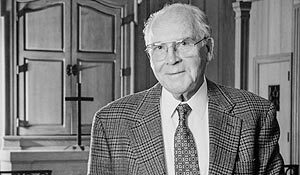 From 1994 until 1996, Harrelson brought the vision for Wake Forest’s School of Divinity closer to reality — articulating the need, developing the first curriculum, reaching out to churches, and raising funds and support. “He was, in many ways, the first face of the divinity school,” said Bill J. Leonard, who was hired as the school’s first dean in 1996 as Harrelson was completing his work.